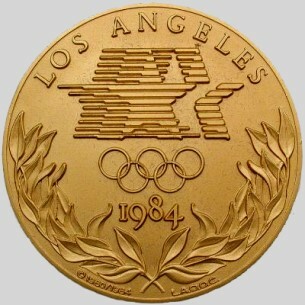 Los Angeles Olympic emblem over Olympic rings and laurel branches. 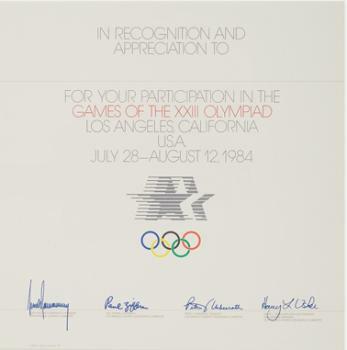 The commemorative medals and the certificates were produced by Jostens. 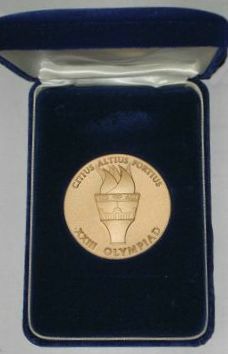 The medals, which were bronze in color and encased in a blue velvet box, were delivered to the villages7 July 1984. 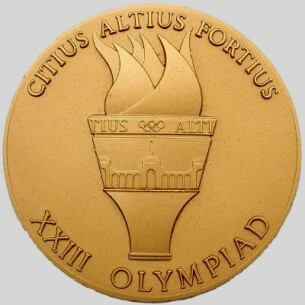 A total of 12,500 medals were delivered (7,000 to the USC Village, 4,500 to the UCLA Village and 1,000 to the UCSB Village) in time to be distributed with the athletes’ and officials’ gift packs. Additional medals were delivered for IOC/NOC officials (1,400) and technical officials/jury members (2,000).